You have a Bluetooth device and you want to use it on your Windows 10 PC. You tried plugging in the Bluetooth device to your computer only to find that you do not have the Bluetooth driver to run the device. 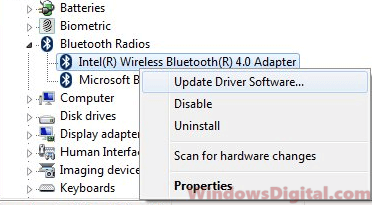 Here’s how to download Bluetooth Driver for Windows 10 64 bit or 32 bit PC. When Windows 10 couldn’t detect Bluetooth devices such as speakers, headphones, mouse, keyboard, adapters or any other Bluetooth peripherals, on your desktop or laptop computer manufactured by HP, Dell, Acer, Lenovo, Toshiba or Asus, downloading and updating the Bluetooth driver for Windows 10 may help solve the issue. There are several methods to download Bluetooth driver for Windows 10 64 bit or 32 bit PC. Try each of the method below until you find one works to detect your Bluetooth device. Normally Windows 10 should be able to detect your missing Bluetooth driver if any is found and install the driver for you automatically when you boot into Windows. If it doesn’t, try running Windows Update as it would usually be able to detect and find the correct driver from Microsoft’s driver repository and install it for you. Optionally, you can also try to update the Bluetooth driver for Windows 10 directly from the device manager. To do so, first press Win+R key to open the run window. Type devmgmt.msc and click OK to open Device Manger. Next, expand the category named Bluetooth or Bluetooth Radios. Now, if the Bluetooth driver is not installed, you should see a yellow exclamation icon next to whichever model of your Bluetooth Device or receiver. Right-click on it and then click on Update Driver Software to allow Windows to automatically search for and install the right driver for your Bluetooth device. However, if you have a very specific Bluetooth adapter which Windows couldn’t recognize, you will have to manually download and install the Bluetooth driver for Windows 10 Pro or Home edition. You may also want to read: Bluetooth Not Working on Windows 10 after update. The best way to update your Bluetooth Driver for Windows 10 is by going to your PC manufacturer websites to download the latest version of Bluetooth Driver that matches the model of your computer. For laptop manufacturers such as Dell, HP, Acer, Asus, Toshiba and Lenovo provides driver downloads on their websites. That includes the Bluetooth drivers for computers manufactured by them. First, go to the manufacturer’s website and look for their driver download page. Search for your PC model on their driver support page and download the latest version of Bluetooth driver for Windows 10. Alternatively, you can use the driver CD that comes with your computer when you bought it. If your PC has a Bluetooth receiver, the driver CD will usually have the Bluetooth driver. But, that would usually be an old and outdated driver if you’ve purchased your PC for some time now. Most PC especially laptops and notebook computers use Intel Wireless Bluetooth technology as their generic built-in Bluetooth receiver. If you have no idea what type of Bluetooth receiver or device you have, you can try to download and install the Intel Wireless Bluetooth driver for Windows 10 and see if it works. 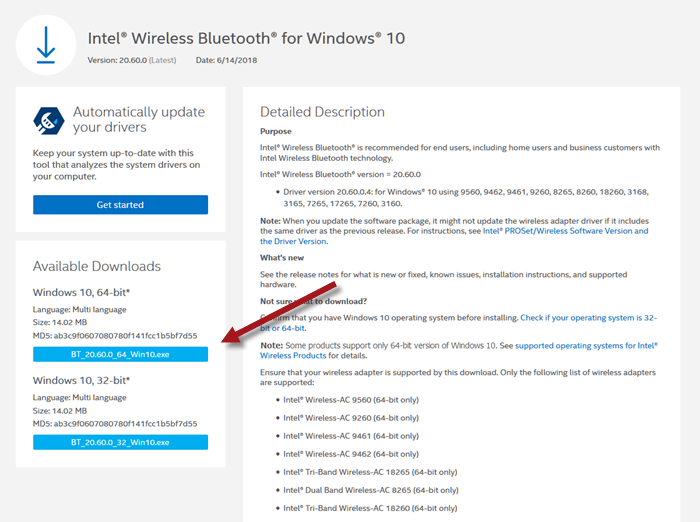 Go to this page by Intel.com to download Intel Bluetooth driver for Windows 10 64 bit or 32 bit. The download link should be on the left in the download page. Select the correct driver based on your Windows 10 architecture – 64 bit or 32 bit. 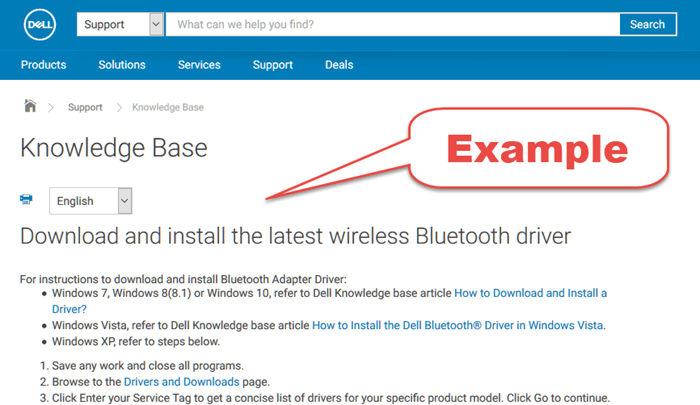 If you know the brand or chip manufacturer of your Bluetooth receiver or device, be it Intel, Realtek, Broadcom, Ralink, Amd, Atheros or others, you can also go to their websites respectively to find and download Bluetooth driver for Windows 10 from their driver support pages. If you have already installed Bluetooth driver for Windows 10, you should be able to turn it on. To learn how to turn on Bluetooth in Windows 10, read – How to turn on Bluetooth on Windows 10. Description for sharing: Download Bluetooth driver for Windows 10 64 bit or 32 bit on Dell, HP, Acer, Toshiba, Asus or Lenovo PC, that runs Intel, Realtek or others.